Time is of the essence when you’re a mom—and really, when you’re a woman living in the modern age! When you’re taking care of kiddos, though, your need to blow-dry and put on lipstick and even shower some days tends to take a backseat to the little ones clamoring for breakfast or a diaper change. 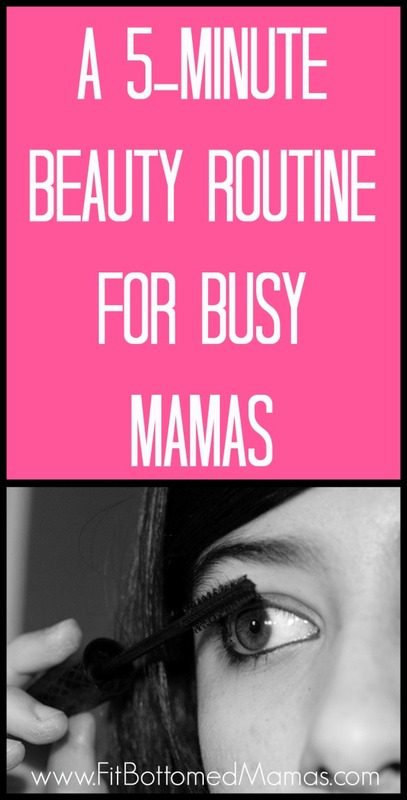 So Jen, blogger and editor for Running With Mascara, has come up with a quick beauty routine of must-dos for busy women. Her shortcuts for this 5-minute beauty routine make mornings a snap—or at least slightly more streamlined! As she says, just because you’re busy, doesn’t mean you have to give up on being the most beautiful version of yourself. 1. Wash your face. This step is necessary to keeping pores clear and your skin blemish-free. 2. Moisturize. Slather your dry skin (this may be your face, arms, hands, legs, feet, whatever!) with a quality lotion. In the winter, this is especially important. 3. Use tinted foundation and powder. If your skin tone or clarity isn’t perfect (whose is?!) putting on a thin coat of tinted foundation can help even out the tone of your skin and conceal blemishes. A dry powder will help this stay put all day. 4. Sweep on quick color. Add a quick sweep of your makeup favorites! I like to throw on blush, eyeliner and mascara, and I can guarantee using just those three will keep this routine under 5 minutes. But the most important part of your routine actually occurs OUTSIDE of the routine. At night, before you go to sleep, be sure to wash it all off! This will keep your skin healthy. Exfoliate or add in an acne-fighting cleanser such as Neutrogena or ProActiv depending upon your needs.